Dark circles are a common sign of fatigue but can also indicate respiratory problems, high caffeine intake and, of course, poor stress management. Although dark circles can appear for various reasons, the good news is that there are home treatments that can help conceal them and even make them disappear altogether. In this article, we’ll share some tips that will help you with those pesky dark circles. However, you need to remember to complement the treatments with good habits, especially good rest and proper nutrition. Also, these circles not only indicate a lack of sleep, but also a person’s state of health. You should first clean your face so it absorbs the components of the treatments well. Before starting treatment, you have to wash your face with cool water and soap. This way, you’ll remove all impurities. In addition, this will make your skin look rested and fresh. 2. Place a cool damp cloth over your eyes. Place a damp cloth in the refrigerator for a few minutes. Don’t let it freeze. Just let it cool slightly and then place it over your forehead and eyes before bed. This is an alternative version of a gel eye mask. You should leave the cloth over your eyes for about 5 to 6 minutes. After about 10 minutes, put it back over your eyes. Repeating this every night before bed can help with bags under your eyes and rest the eye area. 3. Place tea bags over your eyes. Some teas help reduce the appearance of dark circles and eye bags. Prepare a tea or infusion of your choice. Once it cools, slightly drain the bag and place it over your dark circles for about 20 minutes. Make sure they’re at room temperature or warm. After that time, rinse your face to remove tea residue. Chamomile tea bags are ideal for dark circles because they decongest and reduce inflammation, significantly reducing eye bags. You’ll also feel calmer after using them. This is a very famous trick for dark circles. All you need to do is cut a couple of fresh cucumber slices and then chop them in half. Then, place them below your dark circles. Applying certain oils such as coconut can reduce the appearance of dark circles and other signs of aging. 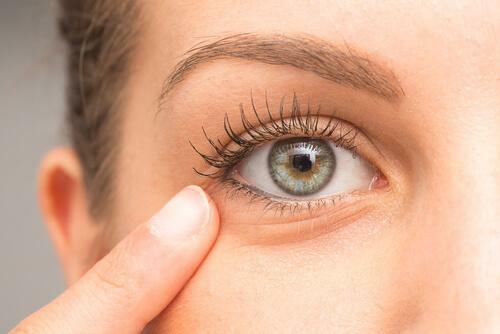 Massage a mixture of a tablespoon of coconut oil and a tablespoon of almond oil under your eyes. After massaging, leave it on for twenty minutes. This will not only help reduce the appearance of dark circles and moisturize the skin, but also promote eyelash growth. What if My Dark Circles Don’t Disappear? If they don’t disappear after following these treatments, then your body is telling you that it needs some rest. Below, we share some additional recommendations. As a first step, you should try to sleep for at least seven to eight hours a day. This is one of the best ways to eliminate these unsightly circles. Also, you should use a daily moisturizer for the eye area. Try to avoid smoking and drinking as well as caffeinated drinks, since they’ll make them more noticeable. Do your best to eat a balanced diet that includes lots of fruits and vegetables. Exercise and drink at least 6-8 glasses of water a day, as these things also have other health benefits. Dark circles can be more or less noticeable. However, the truth is that they’re almost always quite unsightly. Beyond what makeup can do to conceal them, you should try some treatments that can even help eliminate them completely. The options we shared here allow you to pamper yourself and will make your skin glow. Incorporate them into your beauty routine to enjoy the physical and emotional benefits!